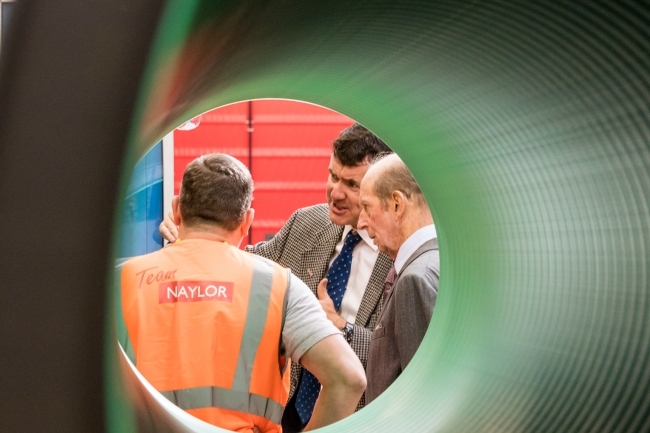 HRH the Duke of Kent has formally opened a new factory extension for Naylor Industries. The £5m investment will allow the construction products company to make larger diameter pipes to carry big volumes of surface water, helping protect Britain against flooding from extreme weather. The family-owned company has installed a high-tech production line to manufacture large diameter plastic drainage pipes for its customers in the infrastructure, agriculture and utilities markets. The previous major development took place in 2008, when the company completed a £4m investment in Cawthorne production facilities to manufacture 600mm diameter pipe, helping the company to accelerate out of the last recession. The new project will manufacture double-walled pipes which are larger still – 750mm, 900mm and 1050mm diameter. The Sheffield City Region Local Enterprise Partnership provided a £615,000 grant to support the project. While the main plant was purchased from its German machinery supplier, around a dozen local suppliers were engaged in the factory extension project and enabling works. The project creates 20 new jobs on the Cawthorne site, including a number of highly skilled engineering roles and a team of Naylor employees was sent to Germany for training with the new equipment. 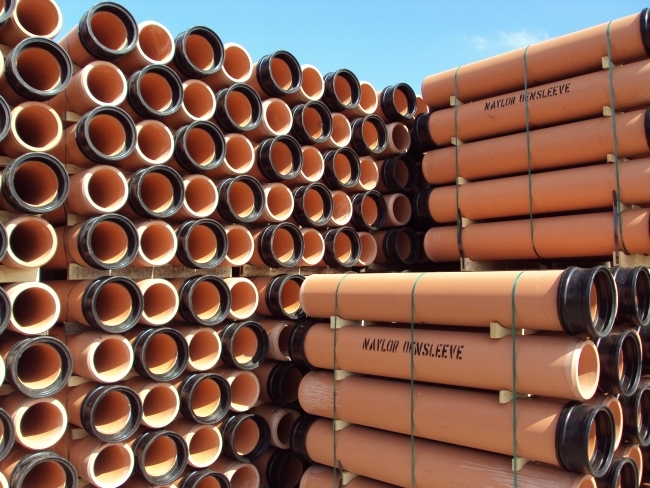 Founded in 1890, Naylor originally manufactured clay brick and pipes but expanded into plastic in 2000. Edward Naylor took over as chief executive in 1993 when Naylor was loss-making and had sales of £12m. Naylor’s turnover broke through the £50m barrier for the first time this year. Naylor today employs 400 people at six sites across the UK. It also has a successful consumer business, Yorkshire Flowerpots, which are guaranteed frost-proof. Every year, the Naylor group manufactures enough pipe to stretch around the world, twice. The new investment dramatically increases the capacity of the company’s Cawthorne site, which already manufactures up to 50 miles of pipe per day. Naylor – which holds the prestigious Gold Investor in People Standard – invests heavily in its people, hiring a dozen apprentices a year to train the next generation of engineers, technicians and craftspeople. It runs two-week summer camps for local school children to learn about career opportunities in British manufacturing, including engineering, technical and craft roles. The Duke of Kent, who is the Queen’s cousin, toured the factory with Edward Naylor and met with staff members and apprentices. The company’s plastic pipe production uses large volumes of recycled post-consumer and post-industrial plastic waste.